Kanye West and Kim Kardashian West competed on "Family Feud." 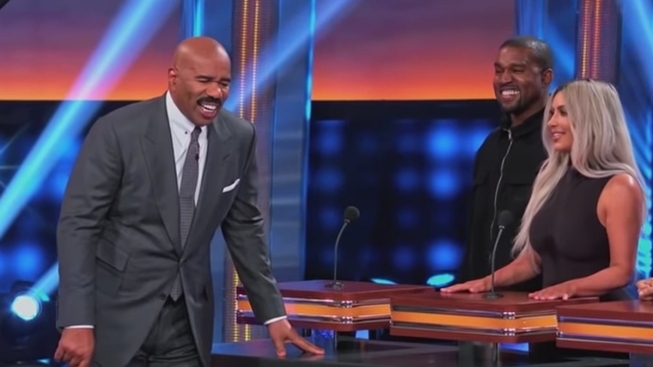 That's what Kanye West had on his face during a duel with his in-laws, the Kardashians, for the premiere of the fourth season of "Celebrity Family Feud," which aired Sunday on ABC. Captain Kanye West introduced Team West: wife Kim Kardashian West, cousin Kim Wallace, Jalil Peraza and Ricky Anderson. "The biggest 'Family Feud' fans. It's all we do, every single night," Kardashian-West said tapping her husband's arm. "Gotta have the Feud!" West shouted to cheers. Team Kardashian was led by Kris Jenner with mother Mary Jo Shannon, daughters Khloe Kardashian and Kendall Jenner, friend Jonathan Cheban and cousin Cici Bussey. The teams guessed what the most likely answers were to questions presented to a group of 100 people like the episode's first question, "Name a reason you think Steve Harvey is a good kisser." West buzzed in and shouted, "lips," the number one answer on the board. "I'm here to win bro, I'm here to win," he said. Team Kardashian pulled ahead in the fourth round to win the game but passed the chance to play "Fast Money" on to Kim Kardashian and Kanye West. "I know they really thought they were going to win -- they didn't. But as sisters, Kendall and I have decided to let them play Fast Money," Khloe Kardashian told the show's host Steve Harvey. Kim Kardashian and Kanye West won the round and $25,000 for the Children's Hospital Los Angeles. Fans on Twitter noticed that West appeared to be at his happiest while competing on the game show. West was recently criticized for calling slavery a choice on TMZ while being interviewed for his defense of President Donald Trump in a series of tweets. West said that although he doesn't support everything the president does, "the mob can't make me not love him." Kim Kardashian West took to Twitter defending her husband against the backlash from supporting Trump.